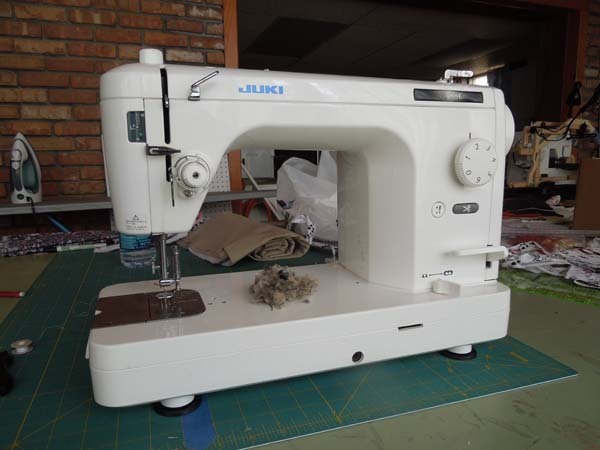 I recently bought a used machine quilting frame, complete with a quasi-industrial Juki 98E. It has a longer throat space than my Bernina has, and it sews much faster. Unfortunately, it was missing bobbins when I bought it, so I had to wait to use it until I could find bobbins for it. Done! So, first things first. When you get a used machine, you clean it. I’m not talking about taking canned air to the bobbin area (which is inadvisable, but I am guilty of doing this as well). I’m talking about taking the bottom off, removing the throat plate, and getting in there with brushes and lots of machine oil. I think I’ll name him Bob. After all of this TLC, I asked my long-suffering husband to load Juki into her rightful place on my machine frame. Funny thing about putting a sit-down machine onto a frame: It’s darned awkward to get the bobbin case seated properly. Unfortunately, when you use a fast machine, it’s kind of like driving a fast car. The going is great, but the accidents are disastrous. This is what happens when the bobbin case falls out of a Juki going at top speed. This is also what happens when you forget to put the presser foot down and then start a Juki at top speed. Yes, I crashed twice within an hour. There are words I refuse to publish in my blog. I used them all. This is a twenty-minute cleanup job, using pliers, screwdrivers, and seam rippers. After all I’ve done for her, Juki is not about to give me any slack. 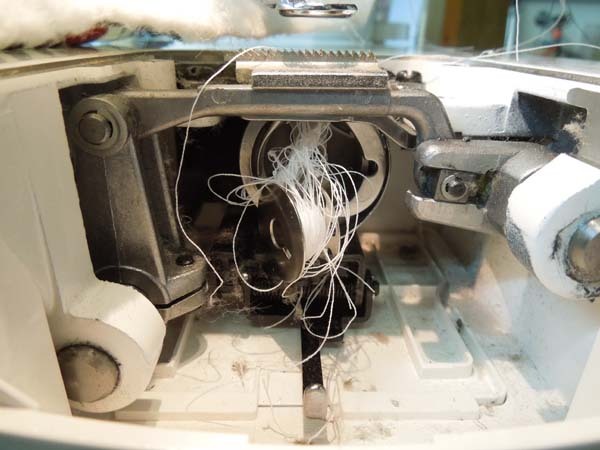 I’m getting very good at pulling thread nests out of this machine. While this is certainly user error, it indicates that one should hang it up for the night. Sleep well, Juki. I’ll be dealing with you later. 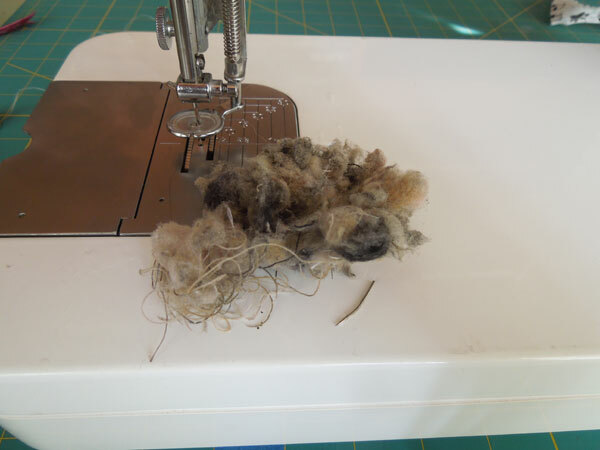 This entry was posted in sewing, studio and tagged bad day, Bobbin, Juki, sewing, Sewing machine, studio. Bookmark the permalink.